Menard were recently contracted to work on Huelva’s train station in Spain. 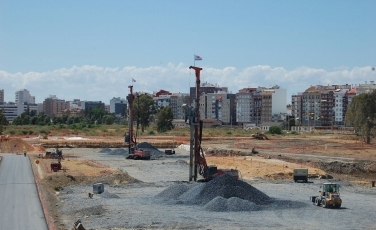 The project, which marked the beginning of the high speed train connection from Huelva-Sevilla with the rest of the Peninsula, involved soil treatment by stone columns of the railway fillings of Huelva’s train station. The project which cost €1,410,718 started in November 2010 was fully completed in October 2015. Menard were contacted to carry out soil treatment by Stone Columns under an open triangular mesh of 1m of diameter and 6m of depth. The soil consisted on a mud layer formed by very soft clays. Overlaying there was a layer of anthropogenic deposits consisting on construction waste and granular materials from gravel pit. The volume of gravel provided was 85.800 m3. Menard used three machines working in parallel to reduce execution time with an average performance of 300 ml per day.